The majority of our clients are in the foodservice industry. We have a vast amount of experience in a variety of kitchen sizes and types. 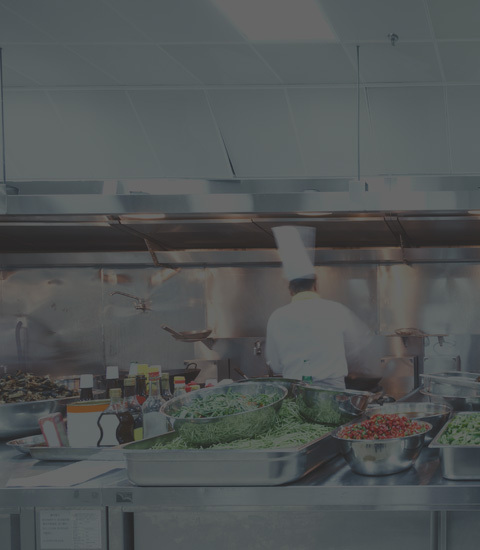 When you need someone you can rely on for meticulously thorough commercial kitchen hood cleaning, to meet or exceed fire codes, you can rely on our team at Facilitec West. Facilitec Southwest’s hood cleaning process keeps your kitchen safe and code-compliant by removing the food and grease residue that can cause exhaust hood fires. Repeat the process as many times as is needed to guarantee the hood is completely clean, safe and compliant. Our three main tools for success include 1) An exclusive formula consisting of safe and effective chemicals 2) High-end cleaning equipment and 3) Trained employees with a mastery of kitchen exhaust cleaning. High end to fast food restaurants. Hospitals, hotels and assisted living communities. Mall restaurants are unique tenants for property developers due to their businesses generating grease and posing a fire risk. The grease from their kitchens can vent out and pool on the mall roof, causing structural damage. It’s not always clear who is responsible for restaurant grease containment in a lease situation. Don’t wait for a health or safety issue to happen. Call Facilitec West for your free evaluation. We can help you determine what type of grease containment solution would be most effective in your situation. Why Use Facilitec West to Clean Your Kitchen’s Hood? At Facilitec West, we have been keeping kitchens fire safe since 1986. We provide a level of quality cleaning and service you can depend on. Reliable, expert technicians with integrity – never a subcontractor. Are you ready for a free consultation? Contact us today to schedule an appointment. We are happy to tailor our services to your needs. Call us today at 888.463.2293.